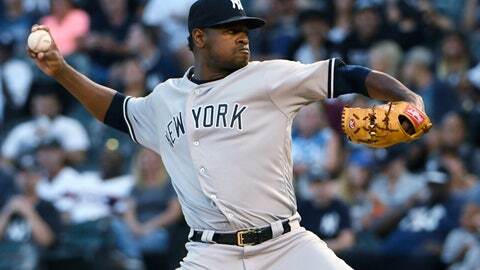 CHICAGO (AP) — Luis Severino has been working on his slider with New York Yankees pitching coach Larry Rothschild. It’s beginning to pay off, too. Severino pitched seven effective innings in his first win in a month, Giancarlo Stanton hit his first grand slam in four years and the Yankees swept the Chicago White Sox with a 7-3 victory on Wednesday night. Aaron Hicks also homered as wild card-leading New York closed out a 3-4 trip with its third consecutive win. While Aaron Judge and Gary Sanchez remain sidelined by injuries, the Yankees posted their first road series sweep of at least three games since a weekend set against the Angels from April 27-29. The Yankees bounced back nicely after they were swept by the big league-best Red Sox, an ugly four-game set that included Severino’s third straight loss. The ace right-hander was a little better this time around, striking out eight while moving into a tie for the major league lead with his career-best 15th win. Severino (15-5) retired 11 in a row after the White Sox used three straight hits to open a 2-0 lead in the first. After Tim Anderson led off the fifth with his 15th homer, Severino fanned the next two batters, and Austin Romine threw out Yoan Moncada trying to steal second. Severino said he felt better about his slider after working with Rothschild on the shape of the pitch. White Sox right-hander Lucas Giolito (7-9) was tagged for seven runs and six hits in five innings in his first loss in a month. He was 2-0 with a 3.42 ERA in his previous four starts. Giolito unraveled for a while in the second, beginning with Gleyber Torres‘ leadoff walk on four pitches. After Miguel Andujar struck out, the next five batters reached safely. Romine and Shane Robinson had consecutive RBI singles, tying it at 2. Brett Gardner was hit by a pitch before Stanton went the other way for his 27th homer, connecting for a high-arcing drive that landed just inside the foul pole in right. It was Stanton’s first slam since April 18, 2014, for Miami against Seattle and No. 6 for his career. He also homered in New York’s 4-3 victory Tuesday night. Hicks added a leadoff drive in the fifth for his 19th homer. His previous career high was 15 last year. Chicago (41-73) had won a season-high four straight before the sweep by New York (71-42). Jose Abreu and Daniel Palka each had two hits and drove in a run for the White Sox. Yankees shortstop Didi Gregorius got the day off. Gregorius played every inning in New York’s previous eight games since it was last off on July 30, including Tuesday night’s 13-inning win. Second base umpire Bruce Dreckman had a bug removed from his ear with the help of Yankees trainer Steve Donohue during the ninth inning. The bug was plucked out with a pair of tweezers and was still fluttering its wings after the ordeal. Yankees: LHP Aroldis Chapman experienced some general soreness after he threw 39 pitches while blowing a save opportunity Sunday night at Boston. But the All-Star closer was available for the series finale against Chicago. “I feel much better,” Chapman said through a translator. Yankees: LHP J.A. Happ (11-6, 4.05 ERA) is slated to start the opener of a season-long 11-game homestand Thursday night against Texas. Happ is coming off the disabled list after being sidelined by hand, foot and mouth disease. Right-hander Chance Adams was optioned to Triple-A Scranton Wilkes-Barre to make room on the roster. White Sox: Following an off day, LHP Carlos Rodon (3-3, 2.94 ERA) starts the opener of a three-game series against Cleveland on Friday night. Rodon is 2-0 with a sparkling 1.56 ERA over his last five games. Rookie RHP Shane Bieber (6-2, 4.58 ERA) pitches for the visiting Indians.